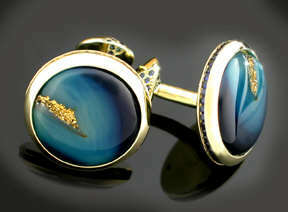 These cufflinks designed by Bill Holman were award winners in the AGTA 2004 Spectrum design competition. They are 18-karat yellow gold and feature Drusy agates with a 24-karat deposition layer over the exposed crystal formation. 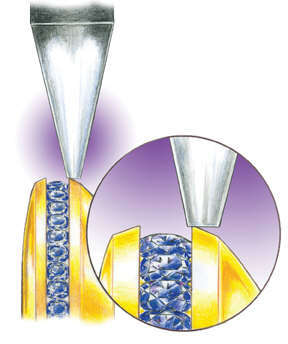 The small gemstones are 1.50 millimeter diamond-cut round sapphires. In this article, Holman shares the details of his approach for making these award-winning cufflinks and how Foredom’s tools, equipment and accessories influenced the quality and ease of manufacturing. Holman first fashioned a slab of wax to the required thickness for his design and scribed a guideline of the shape. 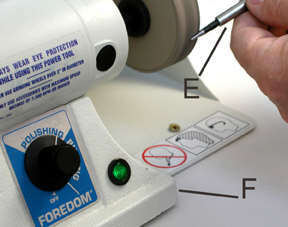 Using the Foredom AllSet&reg; Model-Maker’s Milling Assembly, he cut and shaped the wax. Holman’s Milling Assembly is being driven by the Foredom TX flexible shaft and he’s using a standard No. 30 handpiece. The milling assembly is extremely versatile and capable of being set-up in many ways to accomplish a variety of tasks from wax carving, drilling, grinding, precision cutting and much more. Using the Model-Maker’s Milling Assembly, Holman removed the central portion of the wax to accommodate the center stone. He also shaped the outside dimensions to his guideline. 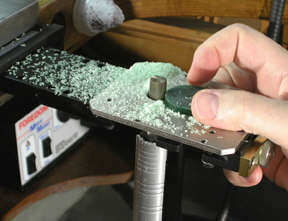 In this photo, he’s using a modified setting bur and the milling table to create the channel for the sapphires around the perimeter of the wax. 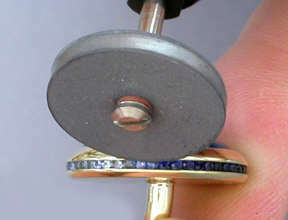 After pre-finishing the castings, Holman created the bearings in the cufflink channels for the sapphires using the Foredom AllSet Adapter Kit with his No. 52 Quick-Change handpiece. Shown is the (A) No. 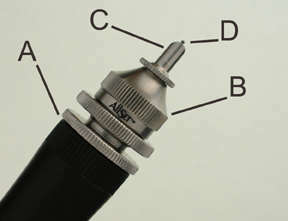 52 handpiece with the (B) mounted adapter nosecone, the (C) channel guide and the (D) bearing bur. Holman used a small 70 degree bearing bur and the channel guide with the AllSet attachment. He adjusted the AllSet for the height of the bearing on the channel wall and the diameter of the bur controlled the depth of the cut into the wall. 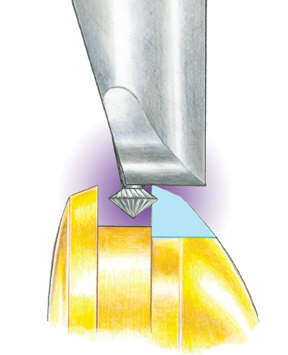 This gave him a symmetrical and ideal bearing for his diamond-cut sapphires. He placed the channel guide on the top surface of the cufflink and burred the bearing around each side of both pieces. Next Holman fit the sapphires into the bearings and hammered the walls using the Foredom Micro Motor Stone Setting/Engraving Micro Motor. Notice that the channel walls are angled. He’s positioned the modified setting anvil on the top portion of the angled wall and adjusted the handpiece for light impact, then hammered the metal downward to further secure the sapphires. Because the impact surfaces of the channel walls are narrow, Holman modified one of the Foredom setting anvils by reducing its face. To do this, he used the (E) holding device to hold the anvil that comes in the Micro Motor kit and ground it to meet his specifications. He used the variable speed (F) Foredom Bench Lathe. 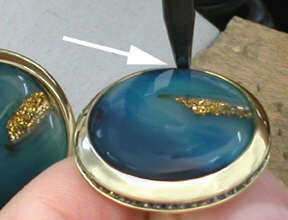 Holman fit the center gemstones to the bezels and made necessary adjustments. 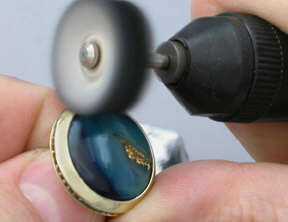 He used the Foredom Micromotor Stone Setting Hammer handpiece to hammer the bezel walls to secure the gemstones. 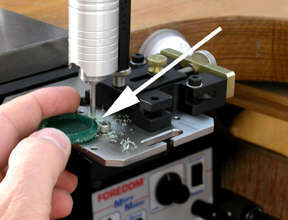 To remove tool marks, Holman used Foredom Ceramic Polishing wheels. They come in six different color coded grits ranging from coarse (120 grit) to super fine (1500) grit. After removing the tool marks and smoothing them with the super fine (1500) ceramic wheel, Holman polished the cufflinks with a stitched buff and Foredom Blue Polishing compound. After cleaning, he finished them by using a loose cotton buff and the Foredom Platinum White compound to achieve his award winning finish. The white compound produces a deep luster and is 8000 grit.